Scania’s 13-liter EPA Tier 3 engine, intended for propulsion and auxiliary use, along with the powerful 16-liter EPA Tier 3 engine, will be showcased at The International Workboat Show in New Orleans, Louisiana. Scania engines are all based on Scania's new modular engine platform, which is used for marine, industrial, power generation, truck and bus applications worldwide. The engines build on a long tradition of power packages that share both technology and architecture with Scania's truck and bus engines. Most repairs and servicing can be carried out by a single service technician, since each cylinder has its own head, which together with wet cylinder liners makes for easy overhauls in confined spaces. The camshaft is located high in the block and the timing gears are rear-mounted to increase the accuracy of engine timing and reduction of noise. 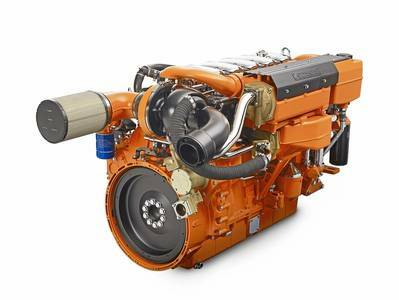 The output ratings for Scania’s newest version of the 13-liter marine propulsion engine ranges from 250-675 hp, and will continue to have outputs up to 750 hp for use in international and exempt markets. For auxiliary applications the range for EPA Tier 3 is 269-426 kW. Scania's familiar centrifugal oil cleaner removes small particles from the lubrication oil, while reducing the size of the replaceable filter cartridge. The Scania saver ring, placed at the top of each cylinder liner, reduces carbon deposits on the edge of the piston crown and reduces cylinder liner wear. In spite of higher performance and tighter emission levels, Scania has been able to increase maintenance and oil change intervals by 25% (now 500 hours) in comparison to its predecessor. Scania also has a new type-approved instrumentation that facilitates installation via a user-friendly and flexible web interface; the marine operator can adapt the information on the displays and choose any required data to be shown. There are program templates for water temperature, engine speed, oil pressure and fuel consumption. Engine-by-engine, the new range has been designed for high strength and durability, Scania said. Many components are shared across the range, a factor that facilitates a reduction in parts supply, since it reduces the number of unique parts used for each engine. The modular architecture and common work methods simplify training in Scania’s service network, while maximizing uptime for users. Scania secures control of all strategic steps in development and performance control. Basic engine development and manufacturing as well as the development of engine management, fuel injection and emission control systems are all carried out in-house. This strategy is motivated by performance and fuel economy demands and targets, as well as by the need to secure consistent environmental performance, robustness and convenience of operation.